Red River Blog Jam: Where is Jessica Simpson? Parking spaces will be hard to find in downtown Shreveport for the coming days. When you see this you know you're really close! Very interesting. 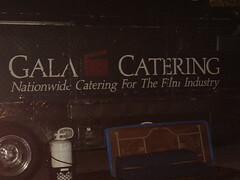 I certainly didn't realize they brought a caterer along with them. Forget Jessica Simpson - Luke Wilson is in town! Oh my God. I saw Jessica early Friday morning driving to the set near the Municipal Auditorium. Luke is cute but Jessica rules the world!! !